The heads of the UK’s spying agencies are being quizzed by MPs and peers in an unprecedented televised hearing. 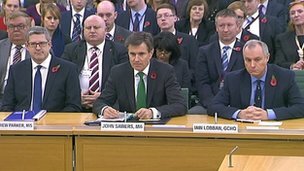 GCHQ director Sir Iain Lobban, MI5 director general Andrew Parker and MI6 chief Sir John Sawers are fielding questions from theIntelligence and Security Committee. Intelligence chiefs have given evidence in private for many years. The questioning follows leaks by ex-US security contractor Edward Snowden which raised concerns about spying. Documents leaked to the Guardian newspaper by Mr Snowden – who is currently in Moscow where he has sought sanctuary from the US – revealed that agencies are able to tap into the internet communications of millions of ordinary citizens through GCHQ’s Tempora programme. Leaks also suggested its American counterpart, the National Security Agency, had bugged the phone calls of several world leaders. The Intelligence and Security Committee – chaired by former Foreign Secretary Sir Malcolm Rifkind – has already carried out a limited investigation into claims that GCHQ used the American National Security Agency’s vast Prism programme, which gathers information from internet companies, to circumvent UK laws. Although the committee cleared the agency of any wrongdoing in the 197 specific intelligence reports it looked at, it is now undertaking a wider inquiry into whether the laws governing surveillance are adequate for the internet age. Sir Tim Berners-Lee, who created the world wide web, has said encryption cracking by UK and US spy agencies is “appalling and foolish”. Intelligence chiefs are expected to be asked about Mr Snowden, as well as subjects including terrorist threats and cybersecurity. Subjects off limits will include details of intelligence techniques and ongoing operations. Journalist Glenn Greenwald, who worked with Mr Snowden on stories for the Guardian about spying by the National Security Agency and GCHQ, said the Parliamentary system had, so far, failed to hold Britain’s intelligence agencies to account. “There was a huge suspicion-less system of mass spying that the British people and the American people had no idea had been built in their name and with their money,” he said. “We won’t be inviting them to give away secrets today but there is a lot that needn’t be secret and indeed in recent years has become, come out into the open, about the way in which the agencies work, their priorities, the way they spend public money,” he told the BBC News Channel. Asked why there had been such a fierce debate about the Communications Data Bill, dubbed the “snooper’s charter” by critics, when GCHQ was already gathering large quantities of data covertly, he said the agency was “primarily a foreign intelligence agency” and the proposed legislation concerned British data. Sir David also dismissed Sir Tim Berners-Lee’s criticisms, telling BBC Breakfast he thought the scientist was “probably exaggerating for effect, in order to get his point across and fire a shot across the bows of the intelligence agencies”. Mr Parker took over as head of MI5 earlier this year. MI6 is charged with gathering intelligence and GCHQ with monitoring communications. The session is expected to last an hour and a half, and will be televised. The BBC News Channel and the BBC News website will be covering it, with a short time delay to prevent anything being broadcast that might endanger national security or the safety of those working for the agencies. 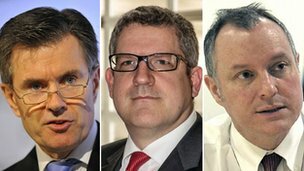 The Intelligence and Security Committee, made up of senior MPs and peers, said the meeting would “give an insight into the world of intelligence and the work the agencies do on behalf of the UK”. The committee said the move was “a very significant step forward in terms of the openness and transparency of the agencies”.